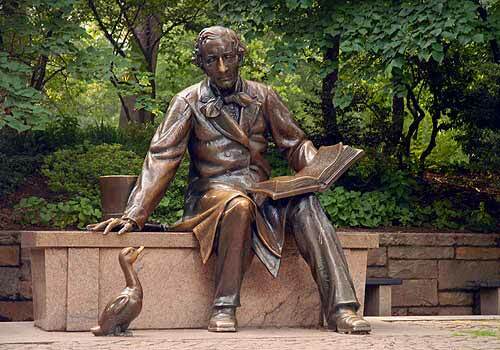 Best known for his children's stories such as The Emperor's New Clothes, The Little Mermaid and The Ugly Duckling, the author's statue includes the seated author holding a book while the little bird stands by the author's feet. The two favorite spots for climbing are on top of the open book displaying the opening lines of The Ugly Duckling and on the freestanding "duck." The memorial was a gift, in part, by Danish and American schoolchildren and funded mainly by Danish-American Women's Association to commemorate the 150th anniversary of Andersen's birth. During the summer months, children flock to the statue for the storytelling program, which began with the installation of the statue. 74th Street near Fifth Avenue west of Conservatory Water.